2016 marked the twenty-first season for the IndyCar championship. Since March 2014, the telecommunications company, Verizon has been the primary sponsor. The series continued to use the fourth generation Dallara IR-12 which was introduced in 2012 to replace the Dallara IR5. 2016 is targeted as the last year for the IR-12. Chevrolet (Chevy IndyCar V6) and Honda (Honda HI13R Indy-V6) were still providing 2.2-liter twin-turbocharged V6 engines for the series. These motors would rev to a maximum of 12,000 rpm producing 550-700-horspower depending on the amount of turbo boost. These manufacturers were also providing aero kits. As in recent years, the season opened in March at Saint Petersburg and ended mid-September at Sonoma, California. There was a total fifteen race weekends and only one double-header event (Detroit). As usual, there was a mix of ovals, road courses and temporary street circuits. Some of the existing events were replaced with new venues. Not making a return on the 2016 schedule were NOLA, Milwaukee and Auto Club Speedway. Added to the new season were Road America, Phoenix International Raceway and The Grand Prix of Boston. The Boston event, set for Labour Day weekend, was cancelled and replaced by a race at Watkins Glen. The highlight of the season would be the 100th running of the Indianapolis 500. The final round of the season took place at the 2.385-mile, 12-turn Sonoma Raceway road course. The GoPro Grand Prix would be a battle for the championship was between Team Penske drivers – Simon Pagenaud and Will Power. Pagenaud held a 43-point advantage over Power. To add to the drama double points were being awarded. 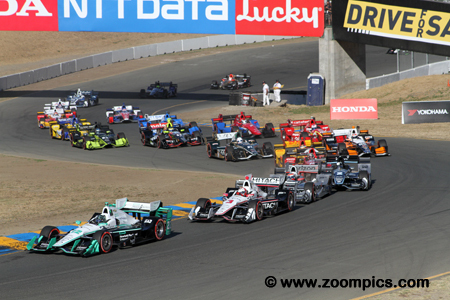 IndyCar point’s leader and pole-sitter Simon Pagenaud leads the twenty-two car field into Sonoma Raceway’s turn two. 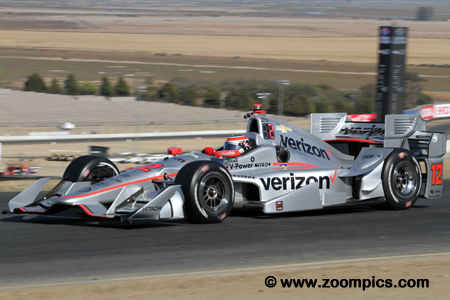 He followed by Penske teammates Helio Castroneves, Will Power and Juan Pablo Montoya. This is not surprising as the Penske drivers captured the first four positions in qualifying. 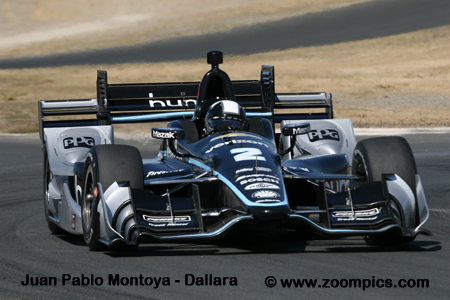 Simon Pagenaud driving a Team Penske Dallara DW12 came on strong in the last half of the season. With double points on the line, his teammate Will Power had a mathematical chance of catching him for the driver’s title – albeit slim. Pagenaud started the event by earning a bonus point for qualifying on the pole. He continued his dominance by winning the race and taking the IndyCar championship. Racing the No. 15 Honda-powered Rahal Letterman Lanigan Dallara was Graham Rahal. The team had a mixed season – some excellent results which included a last lap pass to win the Firestone 600 at Texas Motor Speedway. 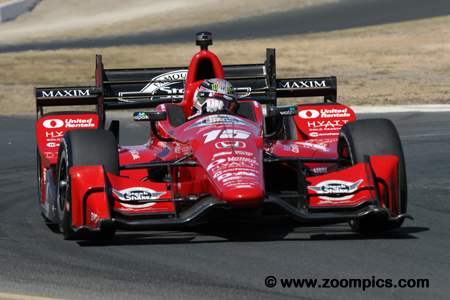 In qualifying at Sonoma Raceway Rahal made it to round three and was the fifth fastest. 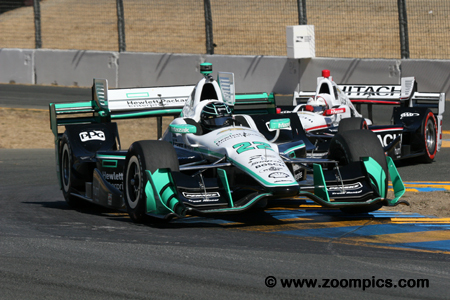 By the mid-point of the race, he had worked his way up to second and closed the gap on Pagenaud but could not pass. 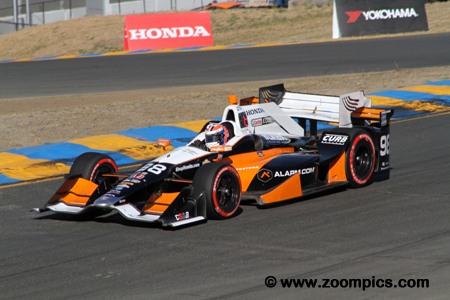 It did not appear to be Will Power’s title to win. Power lost some serious ground in the points chase at the previous round in Watkins Glen when he collided with Charlie Kimball. 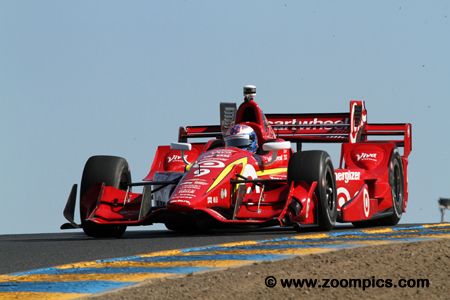 Entering Sonoma, he had a chance to win the championship but it would probably require Pagenaud to encounter problems. This was not to be as it was Power who suffered a malfunctioning clutch control unit. He lost eight laps while repairs were made and finished twentieth. At the end of qualifying, Team Penske driver Juan Pablo Montoya was third quickest among his teammates. 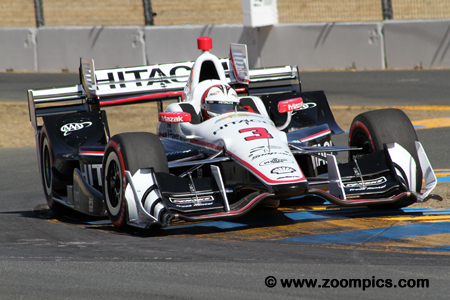 At the start, Montoya was passed by his teammate Will Power and settled into fourth place. Thirty-five laps later when Power encountered clutch issues, he regained third. Montoya moved up and down the order as teams pitted but at the checkered flag he was third. The final member of Team Penske, veteran, Helio Castroneves qualified next to Simon Pagenaud on the front row. Castoneves’ strategy was to make four pit-stops and have fresh tires and plenty of fuel for the final run, unfortunately, there was only one caution which lasted three laps. Castroneves would finish seventh in the race and third in the final standings giving Penske a 1-2-3 in the team’s 50th anniversary. It was a tough weekend for the defending champion and race winner. Scott Dixon was hoping to finish the season on a high for long-time sponsor Target who decided not to renew their contract with Chip Ganassi. Dixon struggled with speed but made progress each practice and just failed to make the cut for round three qualifying. He started from the seventh grid position and was seventeenth at the checker. Rookie and Indy 500 winner, Alexander Rossi was unable to make it past the second round of qualifying and started from the eighth position of the grid. The Andretti Autosport driver moved to fourth place as the race neared its end. Regrettably, the team’s pit strategy resulted in Rossi running out of fuel on the last lap. He only lost one position but it impacted his points - he dropped from a potential eighth in the standings to eleventh. Taking advantage of Rossi’s last lap misfortune was his teammate and 2012 series champion Ryan Hunter-Reay. 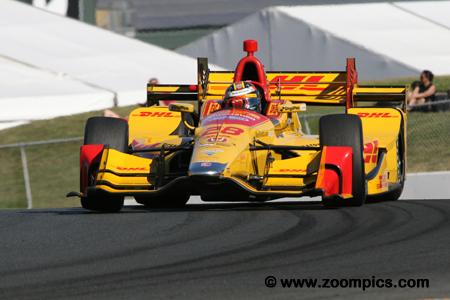 Hunter-Reay started the Honda-powered Andretti Autosport Dallara sixth – the slowest in round three qualifying. When Rossi ran out of fuel, he was the beneficiary and finished fourth. When the ‘dust had settled’ Josef Newgarden was the ‘best of the rest’. 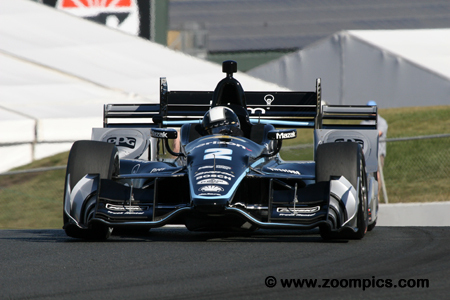 Newgarden was the first driver to finish behind the Team Penske drivers in the final standings. A victory at Iowa and other solid results contributed to his fourth in the points. 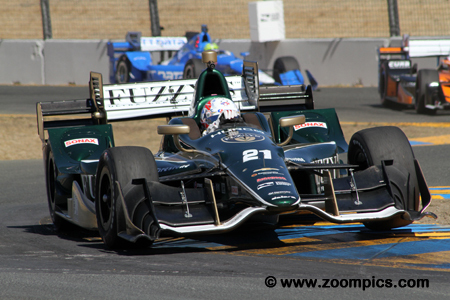 At Sonoma Raceway, the driver of the Ed Carpenter entry had an accident in turn two during practice, with the car repaired he qualified tenth and finished sixth.